A growing sense of intellectual excitement pervades this richly imagined and densely plotted debut, a worthy companion to such successful literary historical fiction as Iain Pears’s An Instance of the Fingerpost and Matthew G. Kneale’s English Passengers. It’s set in London in 1795, a time when England fears invasion by the armies of France’s newly empowered Republican government. Accordingly, Home Office clerk Jonathan Absey is assigned the task of seeking out French spies who may be smuggling vital military information back across the Channel. But that duty is interrupted by Absey’s obsessive quest for the uncaught killer of his 18-year-old daughter—whose fate is echoed in a series of recent murders of young street prostitutes. Absey forcibly enlists the aid of his guilt-ridden half-brother Alexander Wilmot, a homosexual choirmaster and amateur astronomer, when incriminating evidence points to the “Company of Titius,” a group of exiled French Royalists, themselves astronomers, and rumored to be investigating the possibility of a missing planet hidden somewhere in our solar system. Redfern uses this promising metaphor skillfully, introducing one vivid, suspicious character after another: emotionally deranged (and quite possibly psychotic) Guy de Montpellier and his dangerously beautiful sister Auguste; Pierre Raultier, the physician who betrays his own ideals to serve the Montpelliers; Auguste’s “silent satyr” and lover, mysteriously mute William Carline; secretive “spectacle-maker” Perceval Oates; young whore Rose Brennan, who may know more than she’s telling—and numerous other members of the un-landed aristocracy, the rival nations’ governments, and the Company of Titius. The story changes directions deftly when Absey comes to suspect that coded messages are being sent to France under the cover of an elaborate “table of planetary distances,” and a sequence of melodramatic climactic intrigues is set in motion. Only Redfern’s tendency to overexplain (perhaps understandable: the novel is loaded with specific information) and her rather heavy hand with expository detail interrupt the narrative’s breathless pace and delicious complexity. Kick off your shoes, lean back in your favorite chair—and make sure your thinking cap stays securely in place. 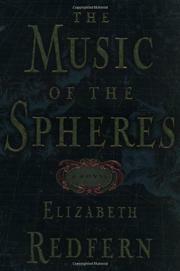 The Music of the Spheres demands an attentive ear, even as its multiple harmonies enchant and satisfy the senses.